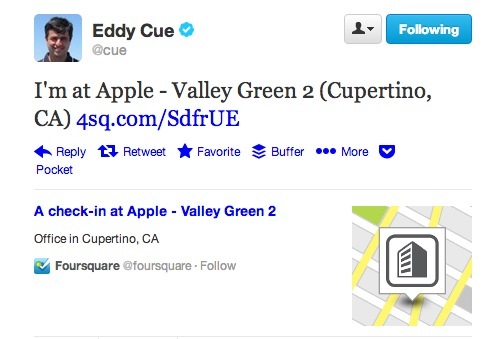 Earlier today, Apple’s Eddy Cue tweeted out his very first Foursquare check-in ever. A couple of minutes later, Cue deleted the ‘badge’ tweet that awarded his first-run status. Foreshadowing? Maybe, and maybe just a random tweet that was a result of Cue playing with Foursquare. Either way, it’s interesting. Cue is known to many as the man CEO Tim Cook just put in charge of fixing Maps, and who already runs all of Apple’s services. The tweet could mean nothing altogether, but Apple execs have telegraphed things like Twitter and Facebook integration via their use of the services previously. The tweet does coalesce something I’ve been thinking about for a while though: It would be a pretty good idea for Apple to integrate Foursquare into iOS. Foursquare is a company I’m pretty excited about. They built up an enormous database of personalized recommendation and location data by essentially positioning the app as a game that you played. You check in, you get a badge, it’s all very pavlovian. But, somewhere along the line, Foursquare CEO Dennis Crowley saw something more in the way that Foursquare’s members were using the app. The comparison to Yelp is accurate, and Foursquare recently added ratings to its app, effectively stepping directly into Yelp’s recommendation engine space. And there are many ways that this new recommendation-powered-by-big-data Foursquare could help Apple with some of its problems, and its possibilities for the future. Maps – Apple may have the worst software debacle of their new era on its hands with Maps. Yes, MobileMe was lame, but it was also a subscription service with a lot less users and not a core service of a smartphone like mapping. And a large part of the issues with Maps come from its POI (point-of-interest) data. That data is what places locations where they’re supposed to be and allows the app to give proper directions. It’s a big part of what people are complaining about with Maps. Currently, Apple uses POI data from Yelp and (I believe) TomTom in its apps. Apple lists over a dozen different vendors, so it’s hard to say exactly which ones provide which data. 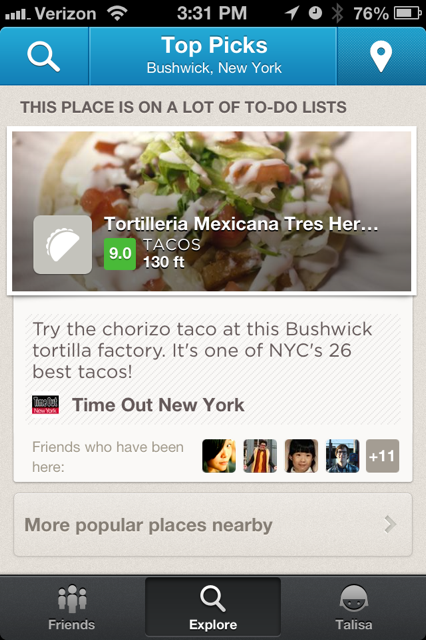 If you’ve ever used Yelp, you’ll know that its data is actually a lot less accurate than Foursquare’s. Because Foursquare ‘came in the back door’ with gathering its data and is so tied in to locations of venues, not just names, its POI data could go a long way to helping Apple deliver better directions and more. 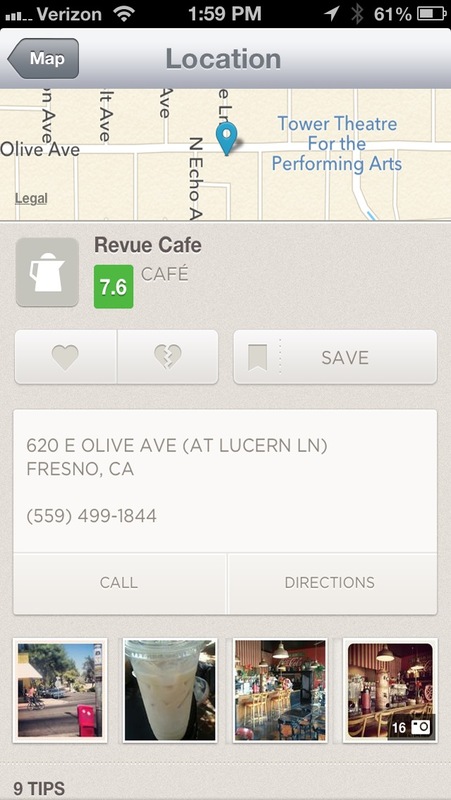 In addition, Foursquare should replace Yelp in the Maps app for location information. It has a much slicker setup for showing promotions running at the businesses and prettier venue pages. Add in Foursquare’s much more accurate and weighted ratings for locations and you’ve got an immensely more useful Maps app when it comes to showing places. Siri – Of course, when we’re talking about locating places to go, we have to talk about Siri. Currently, Siri is integrated with Yelp, and produces a listing result powered by their data when you ask it to ‘find you a restaurant’. This could easily be replaced by Foursquare’s data. And integrating check-ins via Siri would be pretty slick as well, keeping the virtuous circle of data flowing in from ‘power’ users and out to casual users flowing. Single Sign-on – Of course, checking in while in the Maps app and in Siri would require an additional service in the Settings app, but I think that a single sign-on that existed alongside Facebook and Twitter would be great. It provides the first real location service available system-wide. Facebook and Twitter have proven their dominance in the social arena, so it makes sense for them to be integrated. Foursquare is an interesting beast because, though it now competes with Yelp, it is much more location-centric and focused on the social aspects of visiting places than Yelp is. 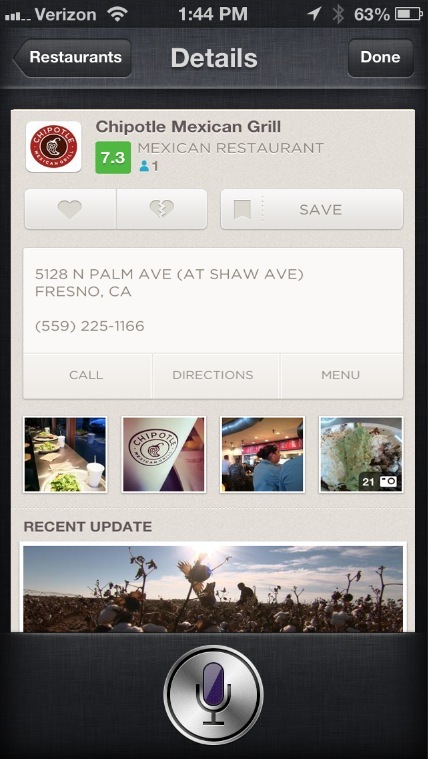 Yelp as a system service doesn’t make a lot of sense, Foursquare does. Calendar – The dark horse here is the Calendar. While Foursquare is often thought of as a place to find places to eat or drink, it also has a ton of business information. Using the enormous database of Foursquare information to provide both a venue for a meeting (currently you just have to type in an address) and the ability for parties to check-in via the calendar or an alert that pops up, would be slick. Imagine checking in to a meeting and your other parties getting the push notification that you’re here and waiting. Very slick. Really, I think that there are so many positives that the only real question is whether Apple will cut a deal to integrate Foursquare into iOS or whether it will just buy the company — which has been struggling to find funding lately — outright.